In Korea, it’s the fermented vegetable side dish kimchi that boosts gastro-intestinal health. In Greece, it’s tangy strained yoghurt packed with probiotics, and in Japan, it’s soya-bean miso rich in good bacteria and a moreish umami flavour. Gut-friendly gems are found all over the world and – like these – they’re often time-honoured foods that have fed and nourished local people with their goodness for generations. A traditional Korean dish that’s very popular in both North and South Korea. Kimchi is eaten there most mealtimes, so it’s no surprise Koreans each get through 25kg a year. Often served simply with white rice, it’s also used in recipes for other national favourites, such as rich kimchi jjigae (stew). 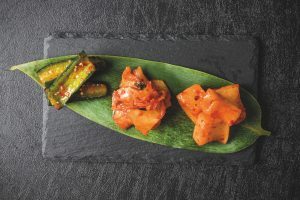 This sweet-sour Korean staple is a spicy pickle fermented in brine (in the same way as German sauerkraut). It’s made with seasonal vegetables – often cabbage or sometimes radish, cucumber or onion – combined with fish sauce or dried shrimp, and seasonings such as chilli, garlic and ginger. Because it’s fermented, kimchi is probiotic and rich in good bacteria, which promotes good gut heath. Many countries have a favourite traditional preserve with a history of sustaining families through the leaner seasons. But so important is kimchi to Korean culture that it appears on UNESCO’s Intangible Cultural Heritage of Humanity list. The process, known as kimjang, follows a yearly cycle: in spring, Koreans gather in shrimps, anchovies and other seafood for salting and fermenting; in summer, they buy sea salt for brine and procure red chilli peppers for drying and grinding; and autumn is kimjang season when the kimchi is made and shared by households, ensuring every family has enough to last the winter. A famous Greek speciality called straggisto in the native tongue. Like other yoghurts, it’s made from milk that’s heated then cooled to the correct temperature before bacterial cultures are added and left to ferment. In Greece, this milk traditionally comes from locally reared sheep, but much of what we call Greek yoghurt here in the UK is made with cow’s milk. But whether from a sheep or cow, one thing we agree on is that true Greek yoghurt is strained to remove a high proportion of the watery whey (the liquid left after the milk is curdled). This straining process makes Greek yoghurt pleasingly thick and unctuous – perfect for a cooling homemade tzatziki, or served with a little local honeycomb as an indulgent breakfast. Because it’s strained, it’s also sometimes used in traditional Greek cooking, in soups for example – as its comparatively high fat content means it’s better able to withstand high temperatures without curdling. 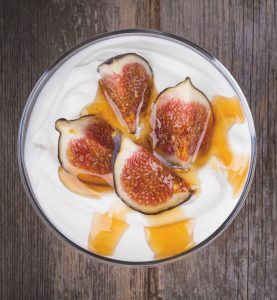 In nutritional terms, strained yoghurt is higher in protein – it can contain twice the amount of regular yoghurt – and because it’s more concentrated, it has more gut-friendly probiotics, too. And that’s not all: since straining removes some of the lactose, it’s also naturally lower in sugar. Middle Eastern labneh and Scandinavian skyr are also styles of strained yoghurt. Miso is a staple seasoning in its native Japan. It’s another fermented product that contains good bacteria. In Japanese, miso means ‘fermented beans’. No prizes then for guessing that this intensely flavoured paste is made from soya beans (one of the central ingredients in Japanese cuisine) and sometimes cereal grains, such as rice or barley Miso contains a fermentation culture called koji (also used in other Japanese specialities, such as soy sauce and sake) that’s produced with a naturally occurring fungus called Aspergillus oryzae. There are many different varieties of miso, including shinshu (light- yellow miso), aka (red miso) and shiro (sweet white miso). The longer the fermentation, the darker and deeper flavoured the miso. The different cereal grains used also influence the flavour. This salty paste forms the basis of the classic Japanese soup of the same name, where it’s combined with other local ingredients, including a fish stock called dashi, mirin (rice wine), tofu (also made with soya beans) and dried nori or wakame (seaweed). 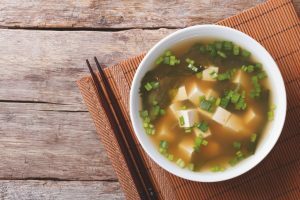 Miso soup is used as the starting point for a nourishing ramen, and the paste itself for meat, fish or vegetables as a marinade, sauce or dressing, too. Paying a visit to France or Norway? Taste these other gut-enhancing local specialities in their countries of origin. No trip to the French Alps would be complete without a gooey wedge of unpasterised soft cheese, or dollop of crème fraîche served alongside a warm slice of apple tart. Fans of tofu should try tempeh when in Indonesia – it’s made with fermented soya beans (unlike tofu, which isn’t usually fermented). of choice in Scandinavia. Rye flour is higher in gut-friendly fibre than wheat flour. In Tibet, the Sho Dun (meaning ‘yoghurt feast’) Festival celebrates the country’s traditional sour yoghurt, which is made from creamy yak’s milk. 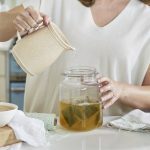 – How to make kombucha. 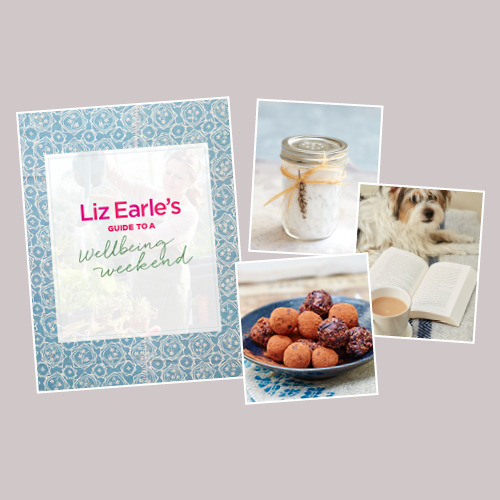 – Find out how to make your own yoghurt.